For centuries, explorers and archaeologists have speculated about the enigmatic giant stone statues on Easter Island. Explanations for their existence have ranged from the idea that they were offerings to the gods to the theory that they marked freshwater sources. 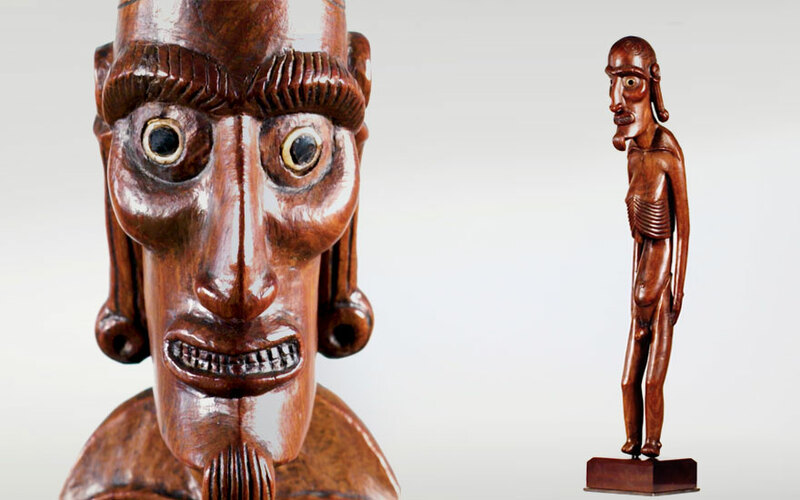 These mysterious objects are not the only puzzling creations made on the island — the ancient Rapa Nui civilization also carved small wooden figures, of which this moai kavakava is typical. They too have long beguiled collectors and baffled experts. Moai kavakava, meaning ‘image with ribs’, refers to the emaciated figure’s over-developed rib cage. It was carved from the Toromiro tree, which was indigenous to the island before extreme deforestation in the 1800s destabilised the ecosystem. ‘It’s a very hard wood, and was specifically selected because it could easily last for centuries,’ says Claessens. Another key feature of the moai kavakava is the hypnotic expression of the eyes, created out of bone and obsidian, which the specialist describes as ‘unusually powerful’. There is also a small hole at the back of the neck, which, according to the observations of 19th-century travellers, allowed the figures to be worn around the necks of men during ritual feasts. ‘Like similar traditions in other Polynesian societies, they most likely represented fertility,’ says the specialist. It was the dream-like nature of the island that most appealed to the Surrealists. For the poet André Breton (1896-1966), Rapa Nui was a kind of ‘modern Athens of Oceania’. He spent his prize-money for good results at school on an Easter Island figure, which he reproduced in his infamous 1928 Surrealist novel, Nadja. Later Max Ernst (1891-1976) used an Easter Island head in his alchemical collage novel, Une Semaine de Bonté, printed in 1934. In fact, so formidable did the Surrealists believe the Easter Island carvings to be that when they published a Surrealist map of the world in an issue of Variétés in 1929, they depicted the island (Ile de Pâques) as being almost as large as Europe (although it is little bigger than Staten Island in New York). What attracts artists and collectors, says Claessens, ‘is that the figure goes beyond the depiction of an ancestor. It is a silent witness to a long-lost civilisation’.